30 Day Bladder Fix, the only DVD that demonstrates medically proven pelvic floor exercises for women and men, earned Amazons Choice. Featured in Prevention Magazine, The Hot Years Magazine and on PBS TV; 30 Day Bladder Fix Pelvic Floor Strengthening program shows you how to stop leaky and overactive bladder without drugs or surgery. DAYTONA BEACH, Fla. - Nov. 20, 2018 - PRLog -- 30 Day Bladder Fix DVD, the best natural remedy for overactive bladder, leaky bladder and prolapse, earned Amazons Choice. Filmed as part of the national PBS TV series, Functional Fitness with Suzanne Andrews®, 30 Day Bladder Fix Pelvic Floor Strengthening DVD shows women and men medically proven pelvic floor exercises to overcome urinary incontinence. Is Surgery Really The Best Option for Urinary Incontinence? Suzanne Andrews developed 30 Day Bladder Fix after experiencing both overactive bladder and a leaky bladder (called urge incontinence and stress incontinence). After giving birth, she hoped her bladder problems would go away. They got worse. She found she couldn't sneeze without experiencing embarrassing leaks (stress incontinence) and was spending so much time in the bathroom from overactive bladder that it started to impact her life. She went to a Urologist and was disappointed the doctor offered surgery as her only option. Surgery is risky and can be dangerous. Being a rehab clinician, Suzanne realized it was best to try non-surgical methods first. Suzanne researched therapeutic techniques and noticed that other programs made people get on the floor and the only exercises she could find were kegels. Since Suzanne had many patients who couldn't get on the floor to do the exercises and kegels were hard to do, she developed easy exercises you do sitting on chair and lying on your bed. 30 Day Bladder Fix includes an entire specially sequenced set of pelvic floor exercises and much more than just kegels. Suzanne stated, "doing kegels and expecting them to cure incontinence is like doing one arm exercise and expecting just one arm exercise to strengthen your arms." Do the Pelvic Floor Exercises Work for Men and Women? 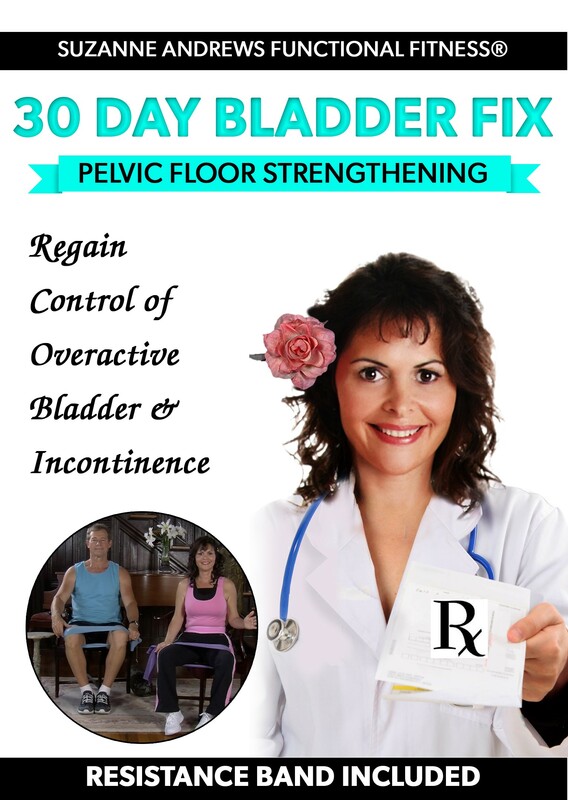 After successfully teaching her effective pelvic floor method to 1000's of women and men throughout the United States, (and curing herself) she developed 30 Day Bladder Fix Pelvic Floor Strengthening DVD as an at home treatment to fix overactive and leaky bladders without drugs and surgery. By doing these easy therapeutic chair exercises, both men and women learn how to strengthen pelvic floor muscles that weaken and sag due to aging and/or childbirth without an expensive physical therapy co-pay and in the comfort of their own home. The DVD includes a free exercise band and is on sale for only $24.99 at Amazon. As with all Healthwise Exercise DVDs, 30 Day Bladder Fix offers a 100% satisfaction guarantee. Order now on Amazon to get FREE shipping.